Sunday’s card at ParisLongchamp offers up a feast of entertainment with a trio of group races for three year-olds the focus of the day’s proceedings. In the Gr.3 Prix Noailles, an important prep for the Prix du Jockey-Club, André Fabre’s Syrtis makes his long-awaited comeback. Winner of his maiden last autumn, he then finished second in the 1800m Prix de Condé and should have no issues over Sunday’s 2100m trip. Stablemate Slalom won both starts in 2018 and looks a serious opponent, but the French pair will have to contend with English raider, Surrey Thunder, who finished second in a Saint-Cloud Listed on his return to competition late last month. 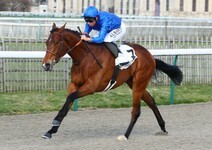 Fabre also looks to have the necessary ammunition for the Gr.3 Prix de Fontainebleau. After running second to Anodor in his maiden, Persian King then went on to win his next three races, his season culminating with a gritty Gr.3 victory at Newmarket. He could well be outclassed this weekend by Epic Hero who trounced the opposition by eight lengths in a Class A conditions on the Chantilly polytrack last month, and looks a leading contender for either the domestic or Newmarket 2,000 Guineas. The Poule d’Essai des Pouliches prep, the Gr.3 Prix de la Grotte, sees the return of Lily’s Candle who won the Gr.1 Prix Marcel Boussac during the autumn before her failed attempt in the Breeders’ Cup Juvenile Fillies Turf. She makes her debut for the Freddy Head yard after having been purchased by Katsumi Yoshida and is expected to confirm her readiness for the coming classic season.